With age comes many benefits, including time to relax and enjoy leisure activities and the freedom to travel and see the world. Unfortunately, many older people struggle with mobility problems that hinder their ability to get out and enjoy the world or to just safely move about their homes or yards. If you're unsteady on your feet or have difficulty walking due to arthritis, an injury or another concern, you must take steps to protect yourself from falling, but that doesn't have to mean being cooped up at home. With Rascal mobility scooters, you can travel anywhere and do all of the things that you love without having to worry about trip and fall accidents. Unlike a wheelchair, a Rascal mobility electric scooter is easy to steer and to move and gets a speed of up to four miles per hour. You won't have to rely on a friend or family member to push you, fatigue your arms by turning wheels or learn to operate a confusing hand control. 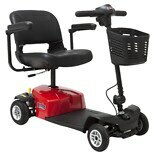 You'll simply sit down on the Rascal and get ready to go! Rascal is one of the leading names in mobility scooterand is synonymous with quality. The models sold at Walgreens come with many state-of-the-art features that make them easier to use than many other mobility scooters on the market. The motor operates on rechargeable batteries. Some of the models can be disassembled, so that you can pack them into your car when you're on the road. When you arrive at your destination, you can put the parts back together and be set for your outing, shopping trip or doctor's appointment. The pieces are designed to be light in weight, making them easy for anyone to lift during disassembly and reassembly. When you're enjoying a trip to the mall, the grocery store or your local outlets, you'll love the convenience of having a basket to put your belongings in, and the design of the seats mean you'll always feel comfortable, no matter how long you spend on your Rascal. With a new Rascal mobility scooter, you can get back your freedom and go virtually anywhere without worrying about your safety. Order your Rascal from Walgreens today.